I love this quilt! I found it online (click to go to site). 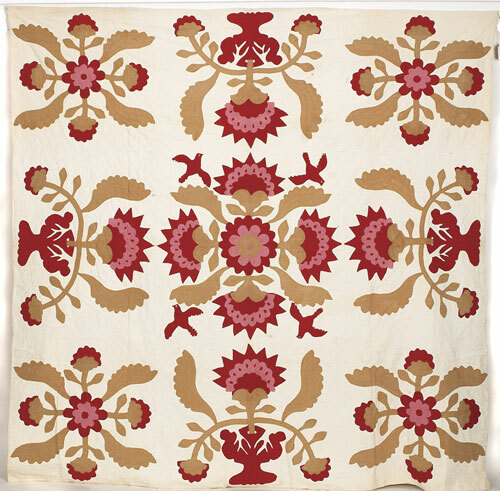 AMERICAN APPLIQUE COXCOMB & ROSE QUILT WITH BIRDS IN FLIGHT and flower vases; ca 1860-80; hand-pieced and quilted in solid red, and beige and printed calico pink cotton fabrics; 70` x 80`. Hmmm… my brain is working… visualizing fabrics… perhaps something more contemporary looking… Wish I could see the quilting better. Gorgeous quilt! I like the color combo and the applique design. Looks like some very good workmanship. that is a really pretty quilt. 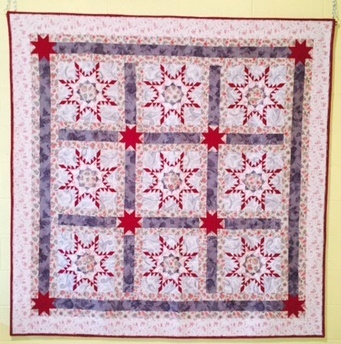 There sure were some good quilters back in the 1800's that the quilts have survived over the years. Nice that they are still around for us to get inspiration from. Beautiful quilt. I love the design and the colours. How are you feeling now with the flu?